At left, the Moon imaged on February 16th, 2013 with the Vixen NA 140 refractor between 400 and 700 nm (visible light), at right between 700 and 1000 nm (near infrared, NIR). The images resolution is equal to 0.27 arcsecond/pixel, obtained with a 10 mm Plossl eyepiece projection. At left, the H alpha solar image (656 nm, 35 nm band width); at right the Sun Ca II H line appearence (397 nm, 3 nm band width) in the same moment; the biggest sunspots visible are numbered 1683 and 1685. This is the result of the ALCCD5V camera 56 seconds footage processing with Registax5 plus IRIS unsharp mask application. The solar granurarity, the faculae and the sunspots are better visible in UV than in the other solar continuum wavelengths (like 540 nm). The technique used, not suited for visual observations, achieving the Ca II H line continuum was to build a filter stack far cheaper than the Daystar arrangement, capable to isolate the Calcium II H line with a precision 6 times greater. The image can be compared with the one taken by the SDO space probe the same day. On the basis of the experiment conducted by Christian Buil, making the difference of two solar images taken through UV filters with close wavelengths (using IRIS program), the Calcium II K-H lines (393 and 397 nm respectively) shall be narrowed up to 1 nm, to do professional Sun spectrograms. DO NOT TRY TO OBSERVE THE SUN USING A TELESCOPE WITHOUT PROPER FILTERING TECHNIQUES. PLEASE ASK ASSISTANCE TO EXPERT PEOPLE BEFORE ATTEMPTING SUCH A DANGEROUS ACTIVITY, INSTANT BLINDNESS OF THE OBSERVER MAY RESULT IN CASE OF UNATTENDED OBSERVATION. The technique used is the same described above, here the maximum camera image width dimension is shown (752 pixels corresponding to 10 arcmin); the sunspots imaged are numbered as in the SDO space probe image taken the same morning. All the images comes from 56 seconds footages processed by Registax 5 and saved in a 16 bit PNG format, afterwards retouched with IRIS tool applying the unsharp masking technique only. The image is more similar to the SDO photo above, at 450 nm wavelength; in fact, the chromospheric CWL 397 nm with 3 nm FWHM Calcium II H-line filter stack arrangement used at Grange Obs. has a secondary photospheric peak at about 470 nm. It was discovered that visually the Sun apperance was better with an O III (peaking at 500 nm) than with a solar continuum filter (540 mm), probably due to a more narrow band widths; the Sun disk seemed more brilliant and more textured with an increased contrast. 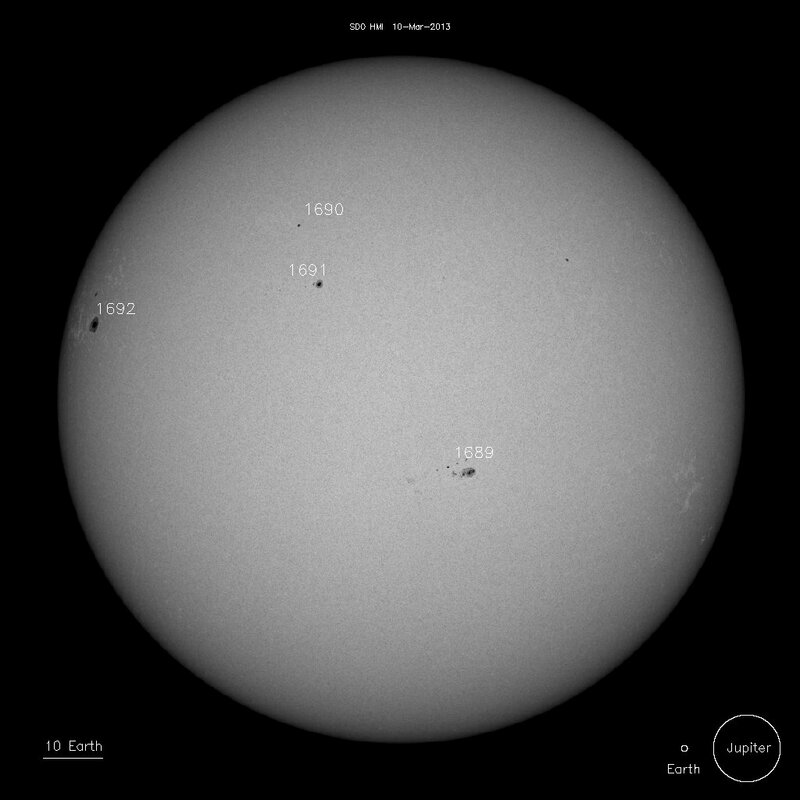 The following day, April 26th, the solar eastern limb sunspots were numbered 1731; the AR 1726 has become invisible from Earth that day, and is poising to generate an X-class solar flares. The 2-minutes footage (1200 frames in total) was processed with Registax 5.2, choosing 1000 frames for stacking; the result was processed by Christian Buil's IRIS tool, applying unsharp mask and constrast enhancement to increase the image resolution. The apparent smallest particular recorded on Sun's surface in the image is about 1.2 arcsecond, corresponding to twice the CCD native sampling (in arcseconds/pixel). Why is this theory applicable? Because the camera's digital-to-analog converter (D/A) yields a sampled signal wave approximating what is imaged, and for not having recontruction curves interference (i.e. electronic noise) their frequency should not be greater than half the input signal frequency. The seeing conditions at Grange Obs., being located in an often windy alpine valley, are rarely suited for high resolution imaging; for the 140 mm diameter scope the theoretical resolution (Dave's formula 116/D) is equal to 0.8 arcseconds at 560 nm, but practically a refractor telescope (without the typical obstruction or reflecting scopes, i.e. the secondary mirror) could reach a value down to 0.6 arcseconds at about 400 nm. The apparent resolution of the image is equal to 0.6 arcoseconds, twice the native CCD sampling as per the Nyquist law on sampled signal reconstruction. The 140 mm refractor equivalent focal length of 4 meter was achieved using the Clave' Plossl 6 mm ocular projection methodology. For achieving comparable photographic results of the Sun please visit the Grange Obs. SPIN-OFF page where proper filters are proposed. Have also a look of High Resolution page for an image processing technique discussion.